Create Your Own Chess Set with a Detachable Board and 2 Full Sets of Punch-out Pieces. Chess is more than just a game; it is the ultimate test of strategy. Its chessboard is iconic, and its evocative pieces have appeared in everything from Alice in Wonderland to Harry Potter. But at its heart, chess remains an engrossing game of mental agility that continues to be passed down from generation to generation. 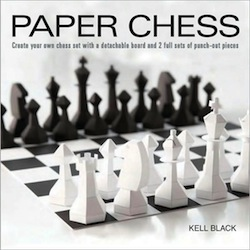 Paper Chess celebrates all of these elements, while adding a brilliant move of its own. It contains everything chess fans need to create their own collectible paper chess setsÑ64 pages of punch-out illustrated templates, and a back cover that converts into a chessboard. Elegantly designed to appeal to the most discerning chess player, Paper Chess is also the perfect way to introduce the next generation to a magnificent game.